When I first glimpsed this device in some of the NAMM show coverage I was immediately taken with it. The image of an iPad with what looked like patch cables coming off it was very striking and rings all the bells of my personal interest in creative control of computers. Using a foot controller with a PC is nothing new, I’ve been doing it for decades with MIDI. At Carillon I designed a system that came with a Behringer MIDI Foot Controller to give control over the original Amplitube. It required quite a bit of setting up, remapping controls via MIDI OX and building preset scripts. The MIDI learning facilities in DAWs these days are much better than they were and so it’s an easier thing to connect up than it once was but there’s still plenty of messing about required. 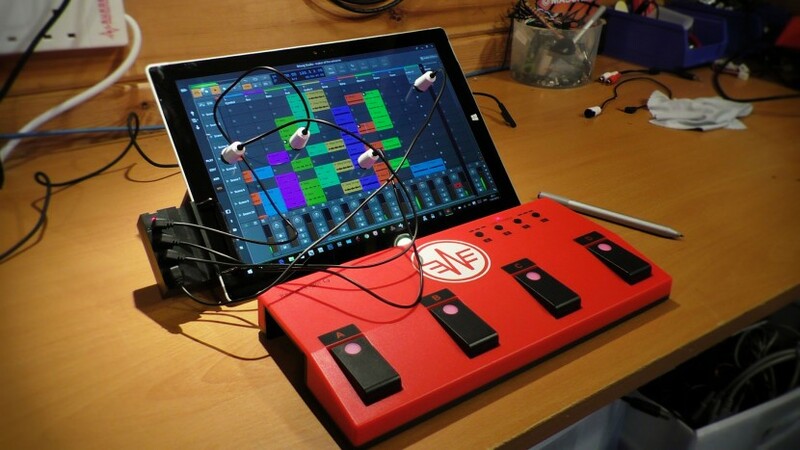 More recently Bluetooth pedal boards have offered a wireless way of controlling software on iPads, tablets and phones. IK Multimedia’s iRig BlueBoard is a perfect way of controlling their Amplitube app, all you’ve got to do is marry up the Bluetooth devices and map the foot switches to the controls you wish to use. None of this is difficult, but it does require some fiddling about and ultimately you’re restricted to what your software allows to be controlled via MIDI. Here’s the video version, for the text just skip below. So what does the Remofinger offer that these other things can’t? The most important difference is that the Remofinger provides instant control over any button or function you can see and tap without any editing, mapping or software setup. It will work on any touch screen tablet/hybrid/desktop and any OS and any piece of software – you want a foot switch to print a document in Word – no problem. You want to select different tools in Photoshop with your feet? This is what you need. How does it do it? Through these awesome physical tapping patch cable thingies. Find the button you want to press and stick one of these suckers on it, then you stomp on the pedal and it literally taps on the button for you. It’s sort of crazy but also wildly useful. And that neatly sums up the device, it’s this mixture of craziness and usefulness, cool and not so cool – is it cool and useful enough though? Let me talk you through the hardware. First impression out of the box is that wow I love that logo – it’s for the Wifo Corporation, the manufacturers of the Remofinger and it’s somehow awesomely retro. And then oh, it’s made of plastic, that’s a shame but at least it’s decent plastic, it’s rigid, has some weight to it and the footswitches seem half decent. All similar devices are plastic and so it’s not unexpected for under £100 but I’d just love for it to be metal. Anyway. From the underside slides out the console and the touch pointers – this is a really nice design, simple and elegant. So what do you do with it? Well you attach the console onto the side of your tablet, plug in a touch cable and sucker it onto the button you want to press – is that mad? Probably yes but stay with me. Turn on the pedal board and the console – all battery driven and you are good to go – that’s it. Stick the touch pointers (as they call them) onto anything you like, move them, remove them whatever. The Remofinger was designed with the iPad in mind but I’m going to be using it, of course, with the Surface. This brings some challenges as well as a much wider range of possibilities. With the iPad all the software is designed for touch and so have touch friendly, finger sized buttons – on the Surface you have a mixture of touch and non-touch software and the resolution of the screen is such that some buttons are going to be very small – so we may have to play with the scaling a bit to make the best use of it. Let’s have a look at a couple of examples to show how well it works. The most obvious use is for the guitarist wanting to turn software effects on and off while playing and the best place for this is IK Multimedia’s Amplitube 4. Now IK have their own Bluetooth pedalboard but it only works on their cut-down iOS Amplitube app or on the Mac, so it’s of no use to the Windows musician. So this is the perfect scenario for the Remofinger. With the console safely attached let’s load up Amplitube. Yikes, it’s really small. I have to say that in this world of high resolution screens and amazing tablet displays software manufacturers have to start including interface scaling as standard – I mean look at it – it’s all rather weeny and it’s going to be worse on the SP4 and SB. Now we can do some scaling in Windows to bring Amplitube up to a more touch friendly size but let’s plug in the Remofinger first to neatly demonstrate one of the draw backs. Let’s load up four stomp boxes and all we do is attach a touch pointer to the onscreen footswitch. The console is labelled A,B,C and D which corresponds to the footswitches on the pedal board. Turn them both on and it works – it’s awesome! Pedal board to software stomp box interface achieved! Now, you may have noticed the obvious flaw – the touch pointer totally covers the switch and the on/off LED so you can’t see if the stomp box is on or off – obviously you can hear it but a visual indication is very helpful. Remofinger have thought about this and have a solution in that the pedal board toggles an LED to show you that you’ve pressed it – but as there’s no actual communication between the Remofinger and software how does it know whether it’s off or on? Well it doesn’t so you have a row of buttons on the pedal board that turn the LED on or off so you can match it to the state of the software. The touch pointers getting in the way is of course going to be a bit of a theme but you have to decide whether that’s relevant to your application – what you’re actually using it for. Let’s make Amplitube larger and see if that works better. On the SP3 I recommend going all the way up to 225%. This highlights the other main issue – the buttons have to stay under the touch pointers. If you move your window around or bring another window into focus then the pointer can’t tap the button – but you wouldn’t do that so it’s not really the issue that you think it is. Right, let’s reposition my suckers and if I’m a bit clever and offset them slightly I can reveal the on/off LED – awesome! The important thing to do at this point is to simply play…. It’s really nice. It works, it’s responsive, it’s hands free and does exactly what it’s supposed to. On a more general note a touch interface it just the best thing for a guitarist. To move a knob I just reach out and move, no messing about with trackpads or mice – the iPad has the same appeal – it’s fabulous. Amplitube has another feature that the Remofinger could get it’s suckers onto – the looper. The Looper is a good and simple 4 track loop function with perfect sized buttons for the Remofinger. It can either be freeform or quantised to tempo, loops 2-4 follow the length set by the first one. Now the first thing that becomes really clear is that I’m rubbish I this looping lark – all this foot-eye-hands-guitar action is a bit too much for my muddled brain but I think you get the idea. I’ve offset the pointers slightly again so I can see what I need to see, but it works perfectly. There is some latency going on, a tiny bit of lag between the pedal board and the touch pointer doing the tap so you have to allow for that. It doesn’t make it unusable by any stretch and I imagine any Bluetooth controller will have a similar latency going on, but it is noticeable so you have to work with it. Now we’ve got the hang of it where else can we use it? The second obvious usage is with page turning. I get asked about this a lot and the best solution I’ve found in Windows is MusicReader. The website is a bit 2009 but it seems to do the job nicely for the small amount of time I’ve looked at it. The basic idea is if you’re a musician following printed music you can catalogue your entire collection as PDF’s and have it all accessible on screen. MusicReader offer a USB or wireless footswitch option for turning pages for around $50 but the Remofinger can do this job just as well. For sheet music you’re probably going to want to use the Surface in portrait mode which is something that the Surface is not really happy with when not being held. Fortunately the Remofinger comes to the rescue because it has a natty built in stand…. The stand is designed for the iPad and the Surface is considerably heavier but it fits into the slot ok and has this slightly untrustworthy air about it – it looks a bit precarious, the console flexes a little bit but it appears to stay there. The console is narrow enough to miss the volume controls but you couldn’t have it the other way up because of the power and USB sockets. Then you launch MusicReader, stick a pointer on the left and right bottom corners and you can turn pages back and forth with your feet – brilliant! Probably, in reality, you’d plonk the Surface on a music stand and have the console clipped to the side or sitting next to it, but otherwise no mess, no fuss. The thing I was most keen to try Remofinger with was clip recording in Bitwig Studio. If you’ve seen my review I mentioned how you can’t set the length of an audio clip to record into which makes it difficult to record guitar on-the-fly. In the end I rigged up a sustain pedal via a MIDI keyboard and mapped it to trigger an audio clip, which, when record enabled, started recording on one press and stopped on another. Although you couldn’t actually set it up like that, it only stopped recording because it was set to “play next clip” which meant you could only record once and only into the first clip – I know that doesn’t make much sense but that’s the best I could work out to make it happen. With Remofinger I could potentially start and stop 4 separate clips – awesome. Now unfortunately this is where I hit a problem – when I hit the footswitch the tap made by the touch pointer is held just long enough to bring up the fabulous radial menu and so inadvertently completely fails to trigger the clip – bonkers! I brought this up with Wifo who went off and downloaded the Bitwig demo, re-wrote the software and have sent me a new one with the ability to swap between two modes – the current tap which they’ve researched and designed as optimum for the iPad and a new mode where the tap is a tad shorter so that Bitwig works – how marvellous is that? There are definitely instances in my live performances where I’d want to add a guitar or vocal loop into a playing Bitwig session. Being able to do that so effortlessly, in any project, at any time, into any clip is simply wonderful. You do have to be careful though about moving windows and the buttons/clips etc drifting from beneath the suckers – but you work to prevent that eventuality. Nothing is ever perfect and I have two small issues with the Remofinger G. Firstly the colour of the patch cables. In some of the pre-release press photos the cables were all different colours whereas the ones I’ve received are all the same, black and white. I think the different colours were a better idea because you can associate a colour with each of the foot switches giving you further visual confirmation that you’re treading on the right switch. This becomes particularly obvious when you look at the second of my small issues – the suckers falling off. As far as I can tell when I’m actively using the Remofinger I’ve never seen a pointer fall off, however, when I got off to do some typing and then come back often they are all sitting in a pile in front of the tablet – I can’t quickly stick them back on because I don’t know which is which, I have to unravel them first, check the connection and then re-stick it. Maybe they need a lick, or my screen needs a clean, or maybe my shed is a bit cold and they would normally stay stuck indefinitely but I am a bit concerned that I would get all set up for the sound check and then go away for a beer and come back and find they’ve all fallen off. In other music software such as Cubase and Pro Tools the Remofinger G can work very well on transport controls. In Stagelight you need two pointers for each clip in performance mode as they have the record and play buttons in opposite corners. In Ableton Live it can work just like Bitwig but the pointers cover two clip heights even at the largest scaling so it’s tricky to see and you could only set up clips to trigger on every other scene – not the end of the world, it’s totally workable. Here’s another completely fabulous idea. Four tablet foot control baby yeah! Why would I want to do that? I have no idea…..
Something told me the first time I saw it that I’d love this thing – and I do! I was crushed when it didn’t work with Bitwig and I’m thrilled that Wifo thought it was worth fixing so now it’s the best thing ever – well, you know, it’s a cool and useful piece of gear. I’m sure it also works brilliantly on the iPad. That was 2015, what’s next? Thanks for the work you’re doing and this “interesting” product. Surface Pro 3.x/4.x don’t get enough, if any coverage, in Pro music blogs. Keep up the good work!